Last year, J.J. Liu came thisclose to becoming the first woman to win a WPT event that you actually have to pay money to enter, coming in second at the Bay 101 "So-Called" Shooting Star main event. This year, it was Jennifer Harman‘s, a woman, turn. "As the last so-called shooting star and last remaining woman in the tournament, I recognize that there’s a lot of the line. You know what I’m saying?" 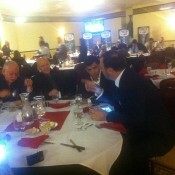 It wasn’t meant to be, however, as Harman bowed out in third place, banking $330,000. It was meant to be, however, for Brandon Cantu, who pretty much was the chip leader or near the chip lead from Day 1. Cantu was never really threatened during final table play, eventually eliminating Steve Sung for the title. 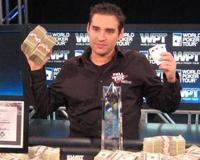 This is Cantu’s first WPT main event win. 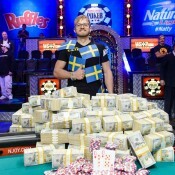 He also won a WSOP bracelet in 2006. For the win, Cantu banks $1,000,000 to go along with the year supply of almonds he won earlier in the week as the Blue Diamond Almonds Bold Player of the Day. 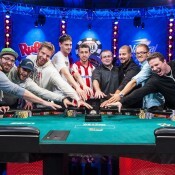 Get full final table results and recap from the WPT site here. * Photo from the good people at Poker Pages.